This comprehensive workshop manual guides you step by step to do any repair or maintenance project on your Mark 2. Suitable for the home workshop mechanic or professional technician this manual will help you restore and maintain your Consul. Very easy step by step instructions with lots of diagrams. 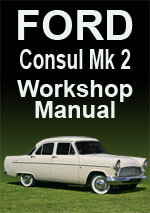 The manual is suitable for the following Ford models made between 1956-1962. Below is a contents list for this workshop manual. Ford Consul Mk2 1956-1962 Workshop Service Repair Manual $19.99 Immediate Download!